Then we met some fellow Canadians. A couple in their mid sixties from Hamilton, Ontario who have spent their years in retirement traveling the world. 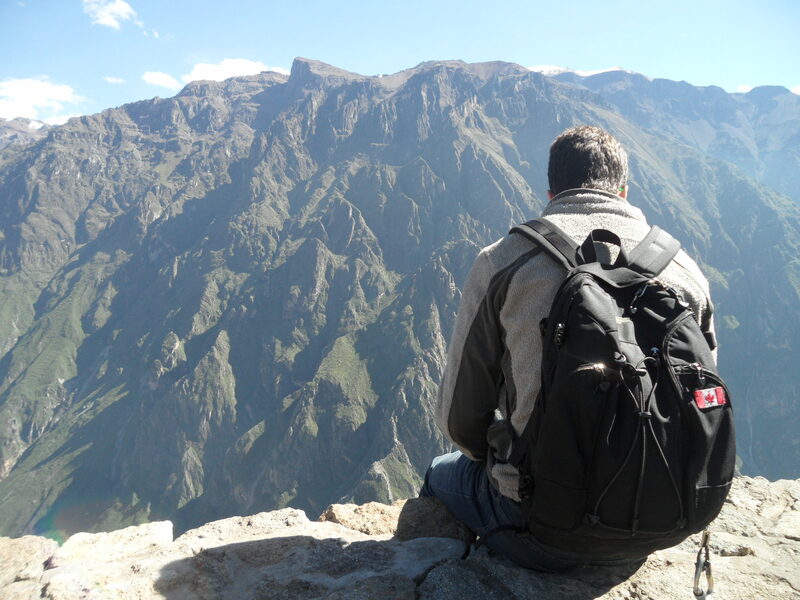 They had wonderful stories to tell us of their travels, and couldn’t stop raving about the Colca Canyon tour they had just been on. We had briefly looked at the tour in our hostel, but the 3am start time and the six hours of busing there and back deterred us from signing up. Unfortunately, by the time they had finished talking it up, we both realized our relaxing time in Arequipa would have to wait. 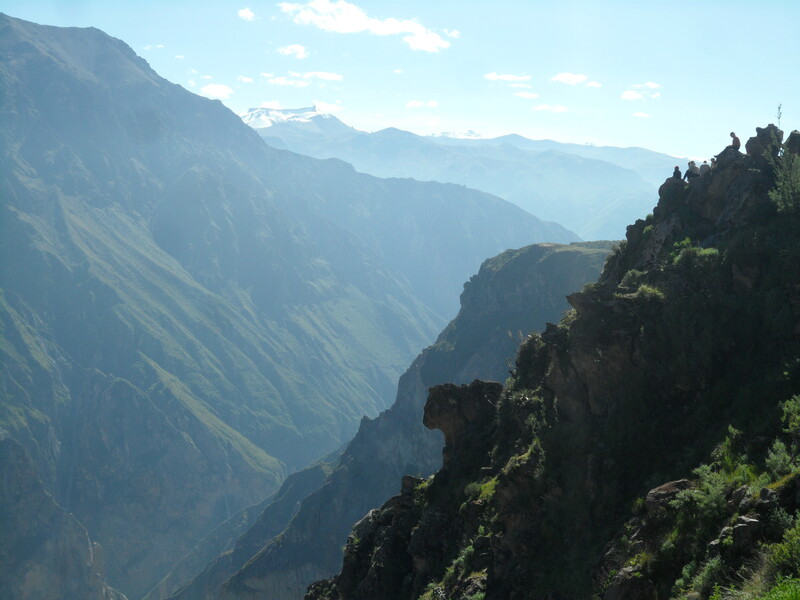 The two argued that the canyon was equal to, if not better than Machu Picchu. 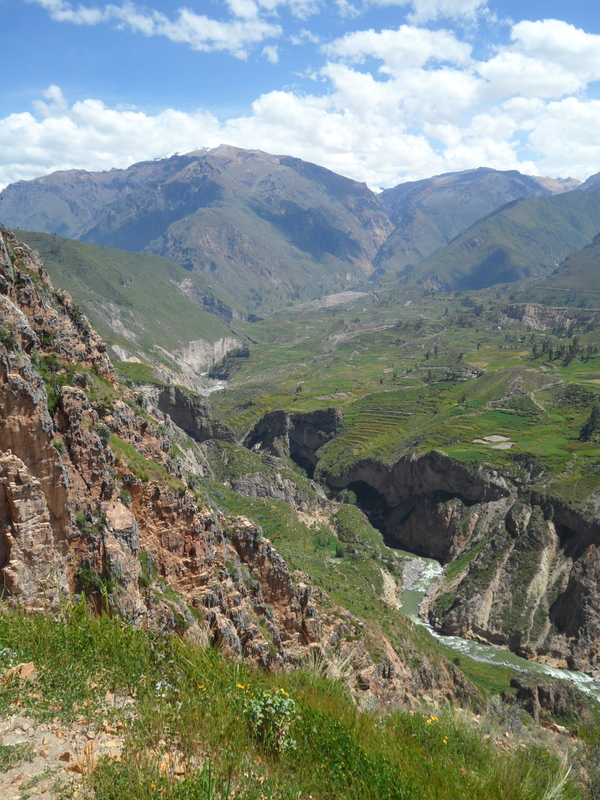 It is the second largest canyon in the world (the largest only a few more kilometers into the Andes) and is actually deeper than the infamous Grand Canyon itself. Needless to say, we went back to the hostel and immediately signed up for the next morning. At 2:30am Sunday morning we heard a knock on our door. 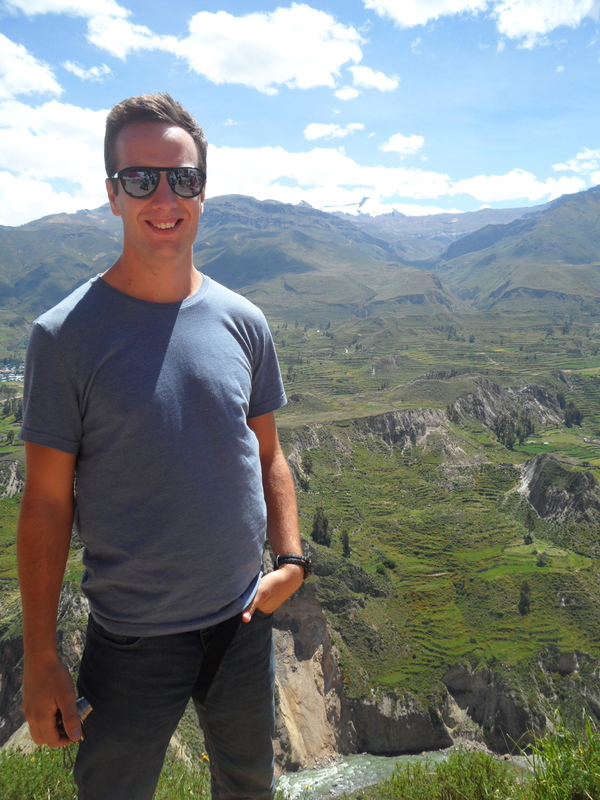 “Colca Canyon tour! Get up!”. We dragged ourselves out of a dead sleep and sped downstairs in record time: only to wait another 20 minutes for the bus to show up. The two of us tried to nod off during our three-hour bus ride to the canyon, but it was a bumpy road and the bus was freezing! Instead it was more of a nodding off here and there trying to curl up into the smallest ball possible for optimum warmth. We were woken again at 6am where we all got off to have breakfast. I don’t know what the temperature was at the time, but it was deathly cold as soon as we got off the bus. You could see your breath and all the windows were fogged from the temperature change inside the bus. Breakfast was warm tea and bread crust with butter… That was it. Nobody was remotely satisfied when our tour guide pushed us all back on the bus 20minutes later. Not to worry, lunch was at 1:00, only 7 hours later! From breakfast we went further into the valley towards the small town of Chivay. The valley was beautiful in the morning sunlight. The place was so green, with thousands of man made, grass terraces stretching for kilometers down the mountainside towards the river at the base of the canyon. 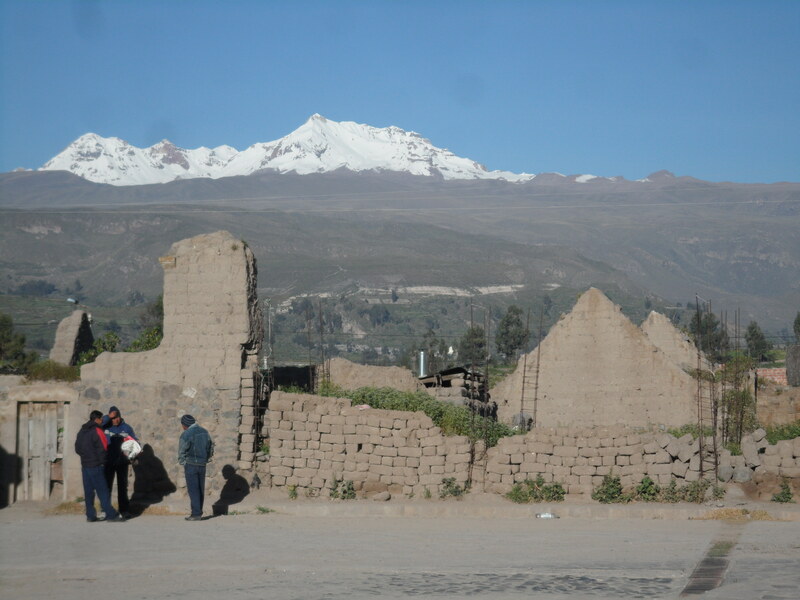 The taller mountains were snowcapped, and it was our first glimpse of snow in South America. 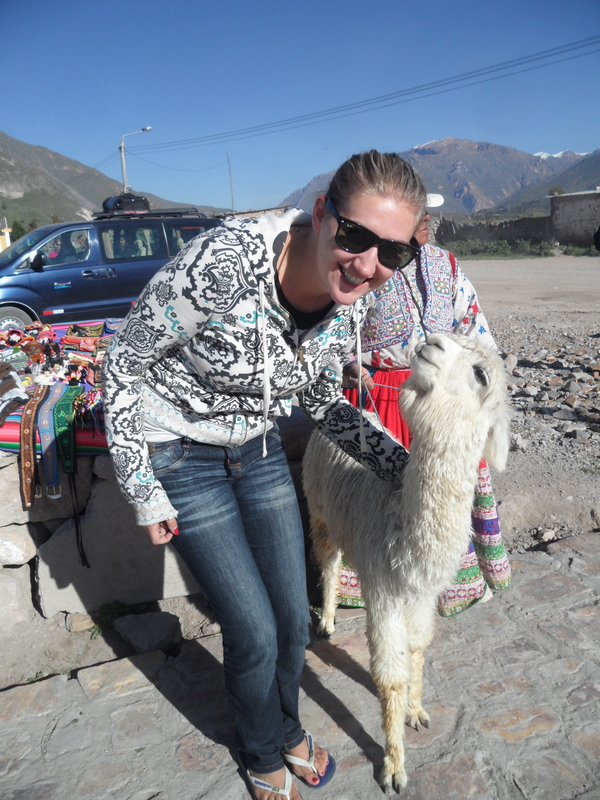 Chivay was a quaint little village, full of busy locals herding alpacas and selling their wares to tourists. The women wore all their traditional garb of intricately decorated clothing: thick, billowing skirts, long sleeved blouses with a vest over top, a colourful hat, and their hair in two long braids that were pinned together at the ends in the middle of their backs. Their clothing consisted of EVERY colour under the sun. No care was taken to make sure colours matched or clashed; the detailed stitching was so busy and had so many shades of colour that the outfit was simply exquisite. 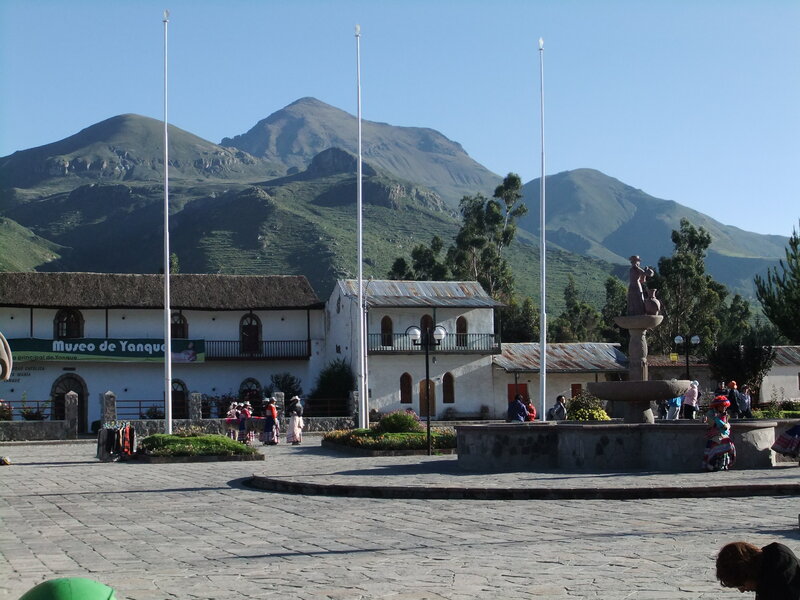 Some women danced the traditional “danza watiti” or the “dance of love” in the town square, while others held out giant falcons and adorable alpacas for the tourists to fawn over. After a short time in Chivay, exploring a couple cathedrals and watching the locals, we continued on towards the Canyon’s deepest point. 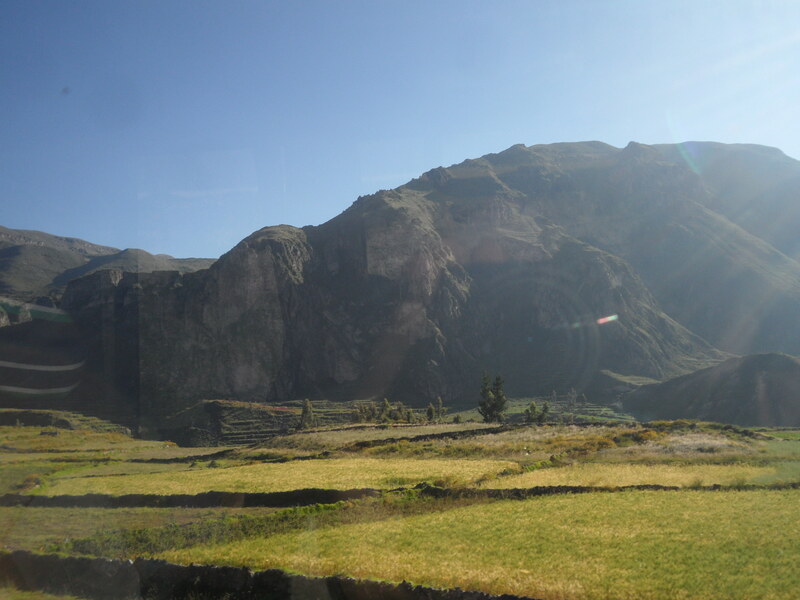 We passed through Yanque, and a couple other small villages on our way, but mostly it was just open expanses of valleys and mountains. No pictures or words could do this place justice. It was breathtaking in every sense of the word. Morning light is by far the best time to see the canyon, because of the contrasting shadows and sunlit spots across the horizon. Even with the villages the place felt remote. There were no large cities or factories; the people still worked the land by hand, walking for miles to reach the different terraces. They all moved about by foot or on mules, and the only vehicles around were the tour buses. People of all ages walked up along the dirt road towards the top of the canyon. At one stop, we observed this little, old, hunched over lady with no teeth, shuffling her way up the hill. The closest town was kilometers away, so she must have been walking from there. Adam turned to me and said “look Hil, if a 95 year old woman can hike up this hill, surely you’ll have no problem on the Inca Trail next week”. We laughed, but found out afterwards that the woman wasn’t 95… Turns out she was 104 years old, and she hiked up and down that hill for kilometers EVERYDAY to beg for money at the top of the hill. OH MY GOD! On top of that, she wasn’t even the oldest person in the area! There was another woman in the next town over that was 111 years old. Unbelievable! It took about an hour, but our bus finally reached the viewpoint for the deepest part of the canyon. The canyon was beautiful, with sheer cliffs of green and grey mountain across from us, and a valley so deep that the massive river at the bottom looked completely still, and no larger than a stream. We sat on the edge of a rock wall with our feet dangling over the edge of the canyon for over an hour just soaking up the view. 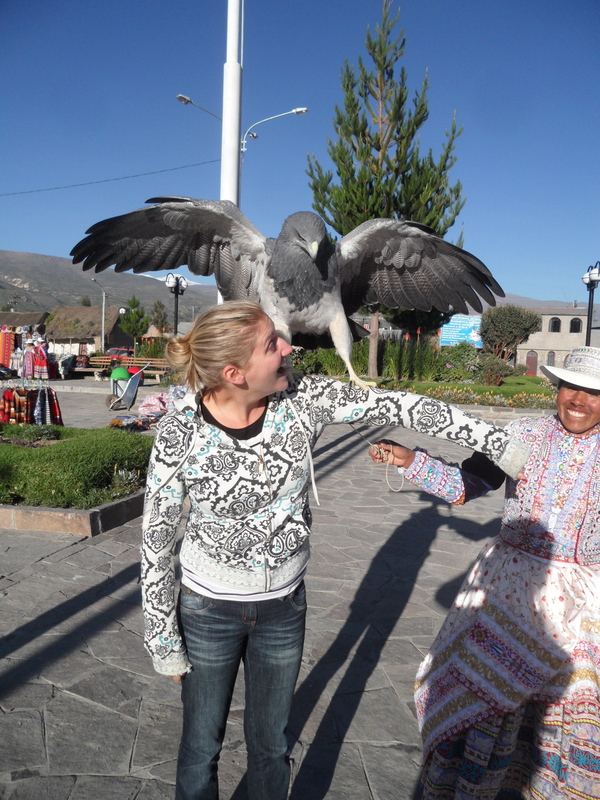 While we sat, a massive Andean Condor floated by the crowds of tourists. 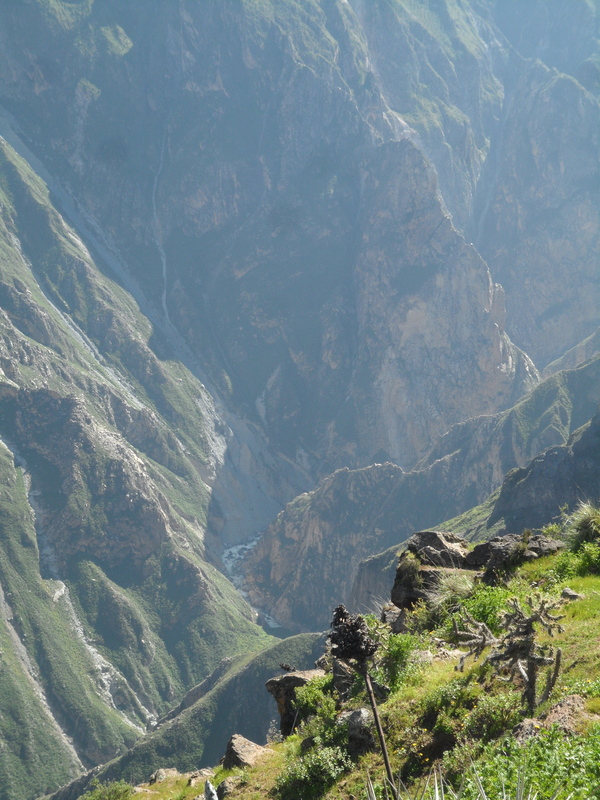 This was a common nesting place for the birds, and although there are not many left in the world, seeing them in the Colca Canyon is apparently quite common. 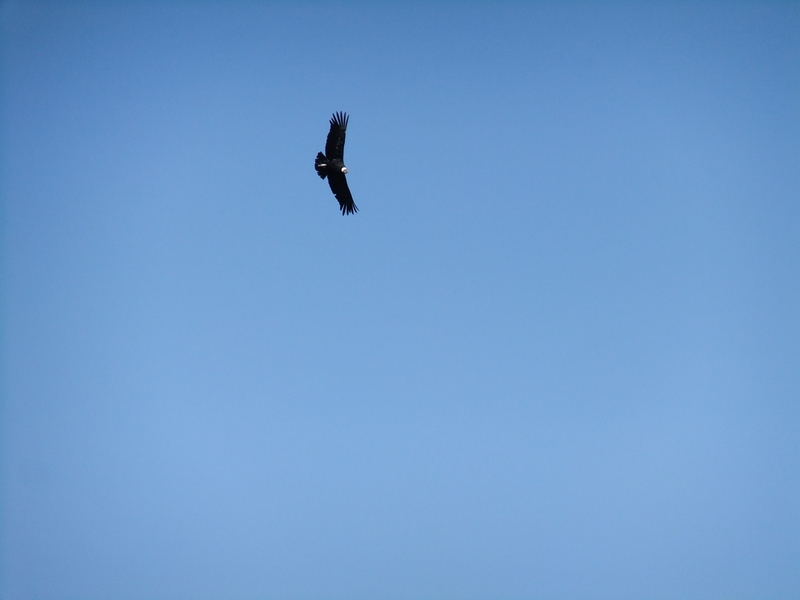 Andean Condors are the largest bird on Earth, and their wingspan reaches over 3 meters wide. The birds don’t flap their wings, but instead, float along the thermal air, reaching extreme heights and depths without moving so much as a muscle. The bird did a couple rounds of the area, at one point getting very close to the crowds as if to show off it’s enormous size. We were at a lower lookout, but even from where we were sitting, we could hear the crowd gasp all at once as the bird flew by them. Eventually, it was time for lunch. We had a huge buffet lunch in town that included all sorts of traditional Andean foods like stuffed peppers and alpaca meat (which is tender and delicious, albeit a little gamey). 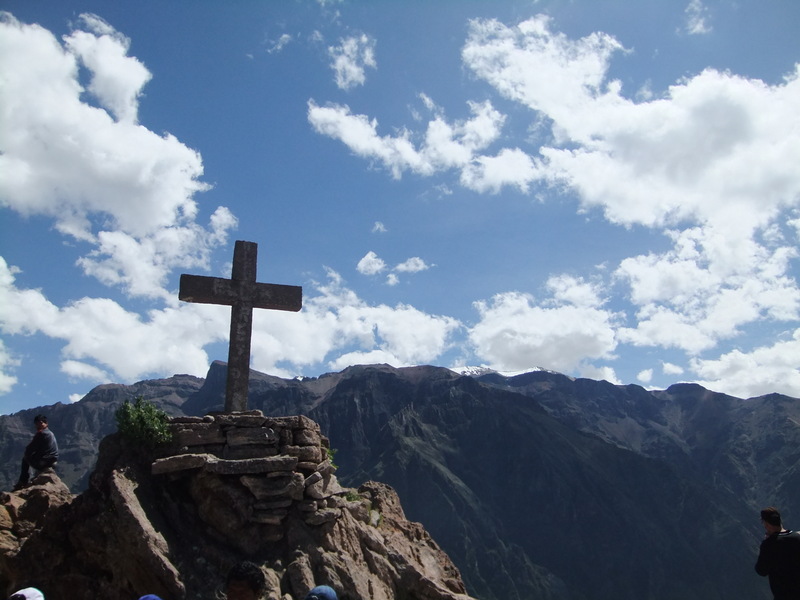 When we had all finished lunch it was time to start heading back towards Arequipa. It was perfect timing really, considering we had perfect weather all day, and as soon as we stepped out of lunch it began to rain. We started our assent out of the canyon towards the main highway. At one point we reached the highest pass on the bus at an altitude just shy of 5000m (by far the highest point of altitude I’ve ever been at!) Our tour guide asked if we wanted to get off to take photos, but at this point it was snowing and hailing outside, and the view was obsolete from the fog. So we trekked onwards. When we reached Arequipa it was going on 5:00 in the evening. Total time on the tour: 14 hours!! We were exhausted to say the least! We had a quick dinner and an early night, as we had fun things planned for the next morning already! This entry was posted in Peru, South America and tagged Andean Condor, Arequipa, Chivay, Colca Canyon, Peru, Travel by hilarylust. Bookmark the permalink.